Two and a half years ago, after Lydia was born, we missed the best weeks of summer. They happened while we passed our time in the hospital. After Abby was born I kept hoping she would come home while the weather was still nice. I love fall. And I wanted to really enjoy it with Abby at home. Instead, the days, then weeks, and even months passed and the season went with them. Occasionally, during a drive to pick up Dan from work, I would notice the brightly colored trees lining the highway. Those were the in-between moments when I was able to enjoy fall…just a little. There was no apple picking, no pumpkins, no walks in the crunchy leaves for us. I kept telling Abby, “You have to come home before it gets cold.” She didn’t. Somewhere in there I was having a conversation with a friend at church. She had just gone through her own share of troubles that had “interrupted life”. It was after this conversation that I noticed a running theme. A lot of people were going through different difficulties that were interrupting their life. Mold problems in the home, sickness, hospital stays, unemployment…and our lives were all put on hold until the troubles passed. And I realized that day that I have to stop putting my life on hold, because what I thought were interruptions in life were actually the seasons of life slipping away while I neglected to enjoy them. So I made a renewed effort to make the most of my season. I tried to enjoy the leaves during our in-between drives. I took Lydia to the hospital garden and watched her balance as she walked along the short stone wall. 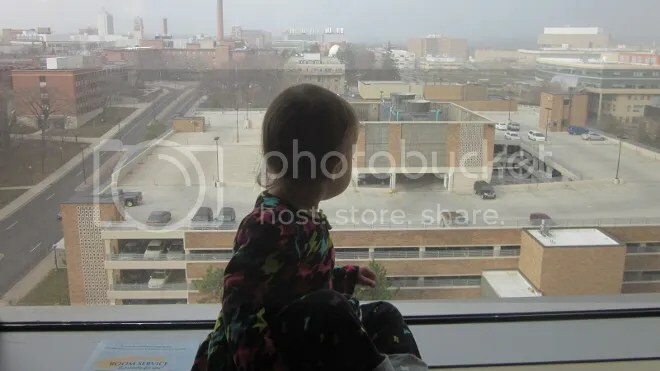 And I captured a precious moment in the picture above when Lydia marveled in one of the first snows of the year while looking out from Abby’s NICU window. 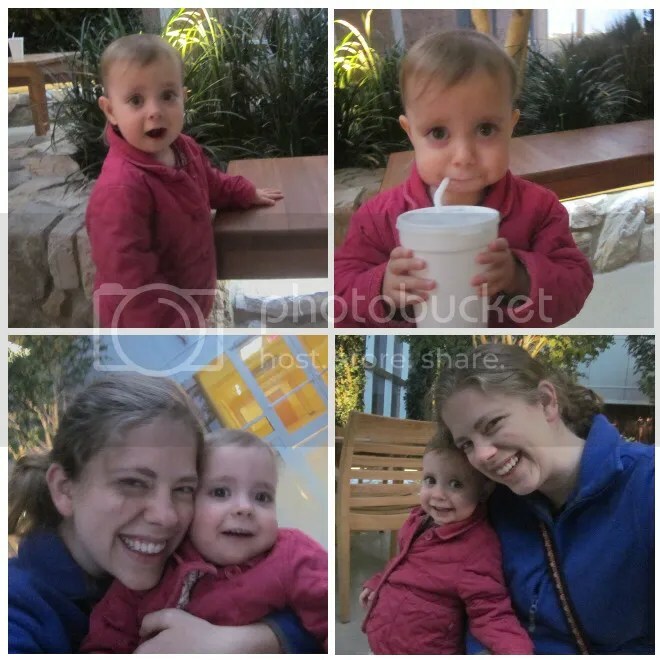 I realized that three months in the NICU were not a chunk of my life just wasted. Life is too short for me to decide certain seasons are “interruptions” in the real thing. “That’s life”, as the saying goes, and I have to make the most of it or it will slip away from me unenjoyed. 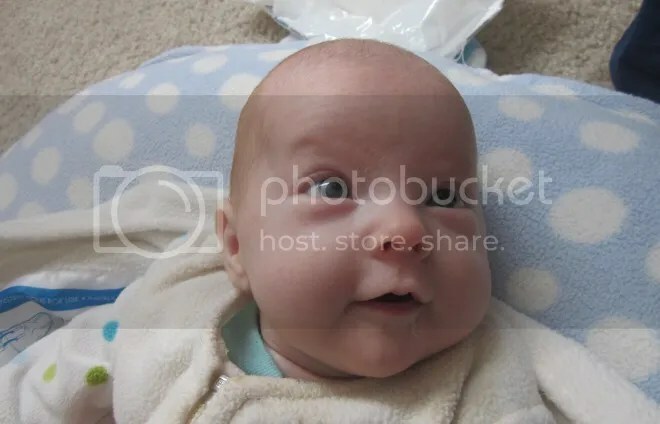 This entry was posted in Lessons and tagged Abby, Christmas, Contentment, family, life, Lydia, Neonatal intensive care unit, seasons, troubles by justeeni. Bookmark the permalink. I’ve thought similar things but it IS hard to “live life” during the hard times. But you are so right, we need to enjoy what we can, even when we eagerly await some season to be over. We periodically go through “survival mode”, often associated with pregnancies and childbirth, but also at times when we have extended illness or when an elderly family member is sick or dies. Wise words.